With only a few simple ingredients, and less than 5 minutes, you will be able to dress up your spinach salad with a maple and orange vinaigrette! Add ingredients to a mason jar and shake vigorously until well mixed. Alternatively, you can add ingredients to a small food processor or high-speed blender (such as a NutriBullet or Vitamix) and blend for 20-30 seconds. 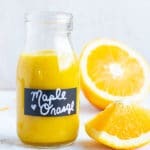 Store maple orange vinaigrette in refrigerator for up to one week between servings. Enjoy! You can use a mini-prep food processor, NutriBullet blender, or a Vitamix with similar results.